Are you looking to grow your agency but struggling to scale due to the time taken up dealing with clients? Or perhaps you’re looking to start offering Facebook Ads services and need to know the right way to onboard and service clients? Either way, this free training is for you! 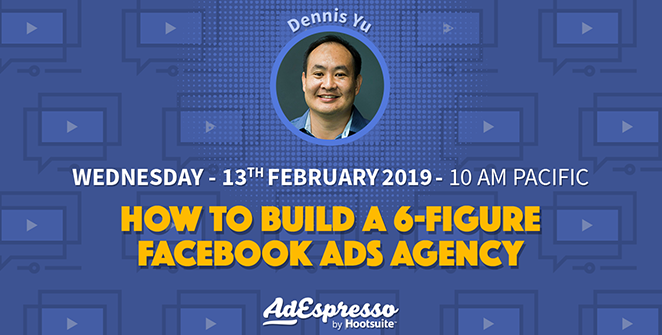 Dennis Yu is the CEO and co-founder of the digital marketing agency BlitzMetrics, he’s also a contributor to numerous publications such as AdWeek and Social Media Examiner and has spoken at over 700 conferences. To run BlitzMetrics while maintaining such a busy schedule he has devised tried and true processes to manage clients. - Identifying your “LIGHTHOUSE” client, so you can repeatedly deliver effective results for your favorite clients.